Commercial Hollow Metal Doors - supply, installation and repair. Commercial Hollow Metal Doors are built to last. In fact, most steel doors can outlast wood doors by 10 years or more. 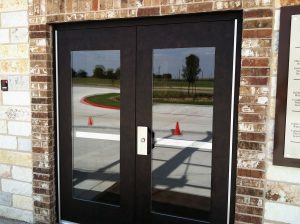 Commercial Hollow Metal Doors are most common on the exterior of commercial buildings. Hollow Metal doors are available in fire ratings from 20 minutes to 3 hours. Commercial Hollow Metal Doors are available from many different manufacturers. Options include multiple sizes, hinge locations, lock prep, light kits, and frame options. Use our Quote Builder to see all options and let us know how we can help move your project forward! Salco Specialities also offers repair and rework of your existing hollow metal doors. Give us a call today or use our form here.